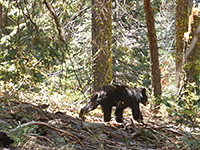 In the Giant Forest area of Sequoia National Park, the granite of the Sierra Nevada is mostly buried beneath the dense woodland but outcrops do occur in a few locations, most notably at Moro Rock, along the side road to Crescent Meadow. 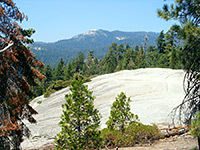 Another exposed granite dome in the area is Sunset Rock, reached by an easy 0.8 mile trail west of the main road (the Generals Highway), starting at Giant Forest Village; as its name suggests this is a favorable spot to watch the setting sun, but provides good views at any time. Despite the proximity to the busy highway and village, few people make the trip so the path is quiet and peaceful. A short, shaky video of a black bear by the trail, scratching against a tree (mp4; 0:18 min; 3.2 mb). Parking for the hike is in the main lot at Giant Forest Village, near the museum and general store, and opposite the Crescent Meadow Road. The path parallels the highway northwards for a short distance then descends to cross a small stream (Little Deer Creek) and reaches a junction with a connecting path to the Big Trees Trail beside Round Meadow. Turning left, the Sunset Rock Trail begins a short and gradual ascent of the hillside above the creek, which is covered by a mixture of pines and small sequoia trees. After here the land becomes level and the trees mingle with patches of grass, bushes and wildflowers, making this good habitat for bears, deer and other wildlife. 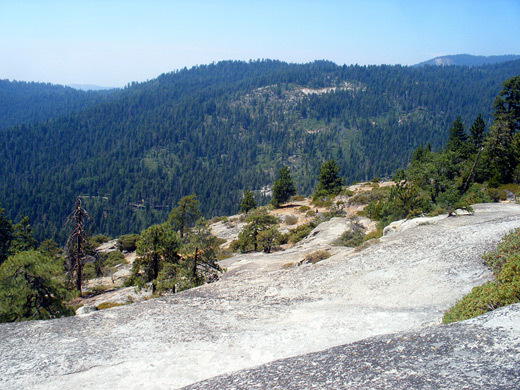 The path arrives at the edge of the plateau, where the distant lands to the west are first visible, then continues along the cliff top, past another junction with a very little used path from the Marble Fork of the Kaweah River along Crystal Cave Road, and out onto the smooth granite surface of Sunset Rock. 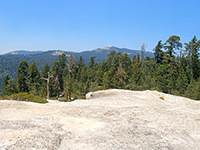 The rock is not very prominent but its top is quite extensive so although half the horizon is formed of trees, they are quite far away (see panorama) and gaps in the woodland allow fleeting glimpses of peaks in the High Sierra to the east. Most of the views are of the Kaweah River valley below and the hazy, indistinct, woody ridges beyond; nothing especially conspicuous but a fine panorama nonetheless. Similar easily-reached granite summits in the Kings Canyon-Sequoia area include Buena Vista Peak and Big Baldy.